Home decor selection for home or office, hotels and restaurants. Gifts for all ages. 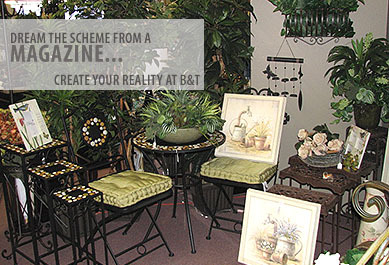 B&T in Dawson Creek offers decor that is the perfect fit for your home or office with artificial trees and large wall clocks easily utilized by hotels and restaurants. Over 6,000 square feet of display space; our decor is for your surroundings, as well as your person. New Seasons page has some great gift ideas for the holidays. Check out our wall-mount electric fireplaces, themed ornaments, and free gift wrapping on in-store puchases. Canada's leading leather line in handbags, wallets and more. These unique designs focus on a classicly elegant style and function. City Gypsies jewelry transcends from day to evening. Unique designs of stones and metals create vibrant pieces as unique as you are. Jewelry boxes are a luxury no woman should be without. From small boxes to large towers, B&T has the perfect fit for any room and any woman. B&T has a wide selection of journals, whether it's for teens or the dedicated writer. A multitude of designs, sizes and page styles, the perfect gift! Artificial flowers, a unique print, regardless of what you're looking for you'll find it at B&T in Dawson Creek. For 25 years clients have told us what they want and we listened, so stop in and see for yourself the amazing selection of home decor. Create your own ambiance with complimentary lighting fixtures; table lamps, floor lamps, and chandeliers. Accent furniture is an eloquent addition. Accent tables to garden benches; they're the missing piece. Throw pillows add balance and interest. A variety of colours, styles and sizes are available. Whatever the trend in colour and design, we carry draperies to suit the decor. Our large panels are perfect for those popular puddle effects. Our table linens and coordinating napkins will impress. We carry the larger, hard to find sizes, so your table looks always looks stunning regardless of size.